Credit: Businger et al., 2018. A major hurricane struck the islands of Hawai'i and Maui on August 9, 1871 and wrought widespread destruction from Hilo to Lahaina. A recent study by two scientists, a Hawaiian language expert, and an educator from the University of Hawai'i at Manoa (UH Manoa) revealed how historical Hawaiian-language newspapers expand knowledge of this and other natural disasters of the past. The storm of 1871 was known from ship logs and English newspaper accounts, but the Hawaiian-language newspapers added significant new information allowing the team to document the intensity and track of the storm for the first time. Following the introduction of the English language by missionaries and the collaborative effort with literate Hawaiians to create Hawaiian orthography, literacy rates in Hawai'i rose from near zero in 1820 to between 90% and 95% by midcentury. King Kamehameha III's call for national literacy was strongly advocated by the ali'i (royalty), and by 1831, the royal government financed all infrastructure costs for 1,103 schoolhouses–and a teachers' college, the first such school west of the Rocky Mountains. From 1834 to 1948 more than a hundred independent newspapers were printed in Hawaiian. This newspaper archive comprises more than a million typescript pages of text–the largest native-language cache in the Western Hemisphere. Newspapers became an intentional repository of knowledge, opinion, and historical progress as Hawai'i moved through kingdom, constitutional monarchy, republic, and territory. A team led by Puakea Nogelmeier, professor of Hawaiian Language at UH Manoa, director of the UH Institute of Hawaiian Language Research and Translation (IHLRT) and co-author of this study, has worked for years to convert Hawaiian-language newspapers to a word-searchable digital format that is publicly available. The IHLRT is associated with the University of Hawai'i Sea Grant College Program's Center for Integrated Science, Knowledge, and Culture, one of six centers of excellence administered by Hawai'i Sea Grant. What they found in the translations was a timeline of the 1871 storm hitting–Waipi'o, then Kohala, then on to Maui–and detailed descriptions about the resulting destruction. One account relays "there were 28 houses blown clean away and many more partially destroyed. There is hardly a tree or bush of any kind standing in the valley." Another mentions "the wooden houses of the residents here in Hawai'i were knocked down." The existence of such a powerful hurricane, uncovered in the historical record, more clearly defines the hurricane risk faced by the people of Hawai'i today. 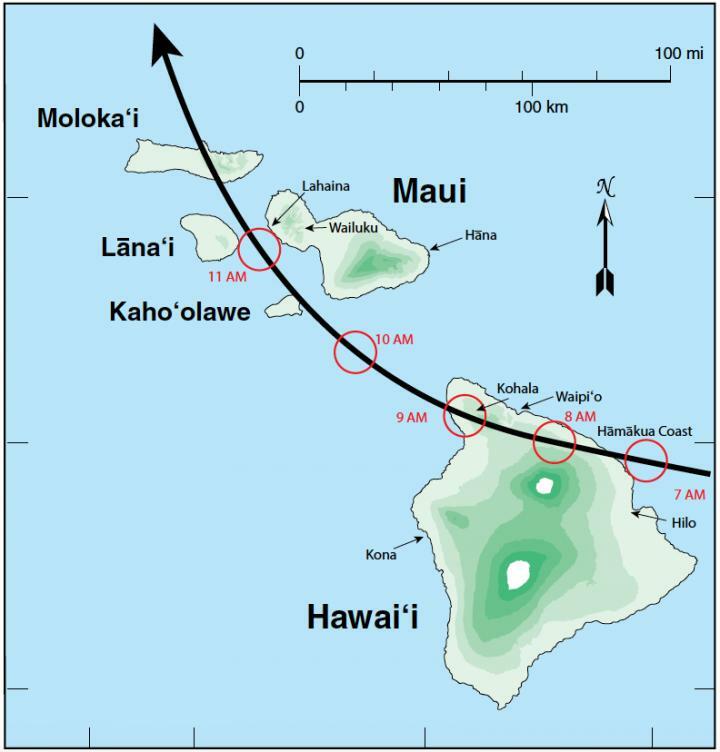 "Puakea's vision has helped conserve Hawaiian language of the past and is opening a window on the historical record that has been long overlooked in Hawai'i," said Businger, lead author of the study and professor of Atmospheric Sciences in SOEST. "The goal of the ongoing work is to extend our understanding of geoscience back into historical, post-contact, and pre-contact times to project and prepare for future events," said Businger. "It is important to note that there would be much greater destruction if a storm of similar intensity and track were to occur today." "These translations are important for STEM education because the articles show that universal public education during the Hawaiian Kingdom led to highly-literate citizens, always observing, commenting, communicating, and sharing information that others were free to comment on," said Pauline Chinn, professor in the UH Manoa College of Education (COE) and co-author of the study. "These are the fundamental processes of science inquiry–sharing of data and interpretations in a public forum for commentary and critique." With support from NSF, Businger, Nogelmeier, and Chinn searched 1870-1900 Hawaiian-language newspapers for articles relating to floods, droughts, and storms, enabling detection of El-Nino-La Nina patterns. Chinn, Nogelmeier, Kahea Faria, assistant specialist in COE, and four graduate students continue expanding the IHLRT database of articles on 'aina-based phenomena, specifically to create a resource for teachers and public. "Incorporating articles into place-based K-12 STEM lessons provides students with historical knowledge of ecological, cultural, and economic changes as Hawai'i entered the global economy," said Chinn. We find students, especially those identifying as Native Hawaiian are more interested in future courses and careers related to STEM, Hawaiian language and culture after these lessons. "We are hopeful that knowing the past can help us to understand where we are now and provide pathways for the future."